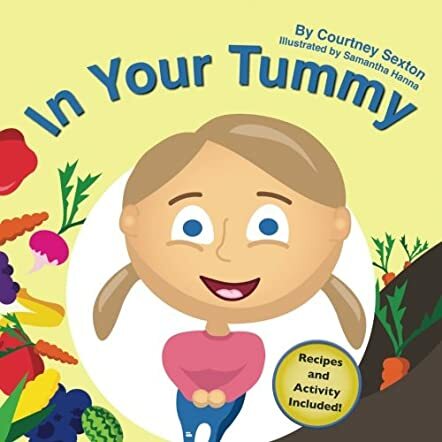 In Your Tummy by Courtney Sexton is an informative and educational book that tells children about the importance of eating healthily. Nori is working hard in her garden so that she can feed her hungry friends. Nori is growing carrots, blueberries in her blueberry patch, apples in her orchard, and other fruits and veggies. She decides to make a meal that will make all her friends happy. Nori makes kale for Dale, she chops a carrot for Garrett, dices an onion for Runyan, and splits a banana for Hannah, and she is ready to feed her friends. Let us find out from Nori where her friends live. The story speaks about the importance of eating healthily so that the good bacteria inside our tummies help us to stay happy and healthy. Nori calls the bacteria in her tummy 'friends' because they are good ones and they keep her healthy. The approach to the topic of eating healthily is fresh and unique and that makes the story an exciting one. The illustrations by Samantha Hanna are lively and colorful and they breathe life into the author's words. It is a good story to help children understand about eating healthy foods and can be used for story-telling at home and in school. The recipes at the end of the book can be tried out at home during the weekend under parents' supervision, and the food and character cutouts at the end of the book make it good for interactive sessions and art and craft activities in classrooms.